The end. 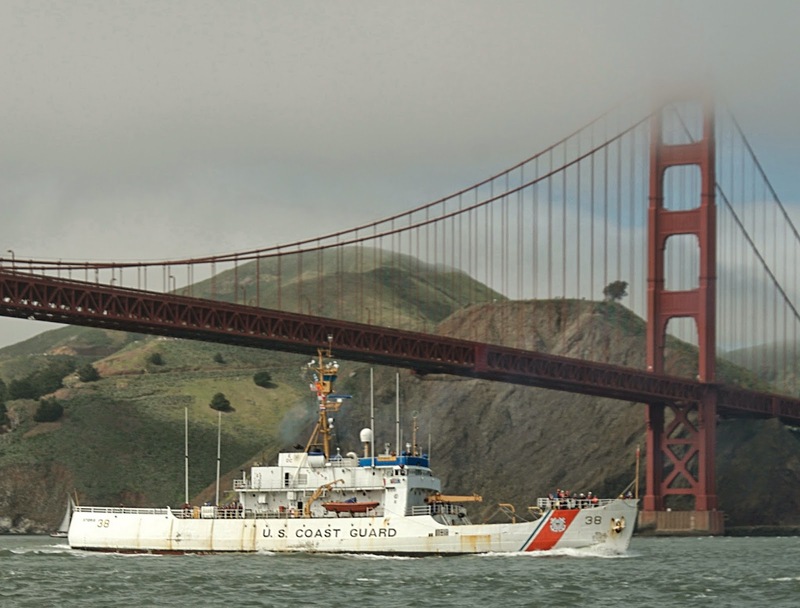 The decorated and nationally historic USCGC STORIS passes under the Golden Gate Bridge on March 28, 2007 on her way to the mothball fleet and eventual destruction in a foreign scrapyard. For decades, STORIS served her country with honor, respect and devotion to duty. She protected mariners, her citizens and the environment. Upon her retirement, the government she served let her down. Inexplicably, she was allowed to be illegally exported for dismantling in a foreign scrapyard where environmental and occupational safety standards are lax compared to the U.S.
Now, through her loss, STORIS may have the opportunity to make a difference for her country and environment one last time. Sen. Mark Begich of Alaska is preparing to introduce legislation called "The Storis Act." I am not an attorney. I am not fluent in "legalese." Nor do I pretend to fully understand all of the various regulations this legislation would introduce or modify across several established laws. However, this legislation would be landmark in nature, requiring that, starting with ships in the U.S. Maritime Security Fleet, ultimately all U.S.-flagged commercial vessels will have to be dismantled and recycled at qualified U.S. ship recycling facilities. This will prevent American vessels from being sent overseas for scrapping in foreign scrapyards, particularly those infamous yards on the beaches of India, Pakistan and Bangladesh. Links to several media stories and commentaries about these third-world ship demolition locations are posted elsewhere on this page. It has been discussed here about the evils of U.S. vessels being cut up in these locations to avoid environmental responsibility, causing pollution to run directly into the sea and with workers mangled and killed in abhorrent working conditions for minimal wages. That would end with this proposed legislation, ensuring that American ships are dismantled in environmentally sound U.S. ship recycling facilities following strict environmental standards. It would also ensure that skilled American jobs and revenues generated in these facilities stay in the U.S. The legislation will prevent the practice of "reflagging for convenience," where a U.S. ship is sold to a foreign owner to reflag it specifically for the purpose of skirting U.S. regulations and the stigma of sending American toxins to lesser-developed countries. The legislation reinforces a program that ensures that a percentage of revenues generated by the scrapping of federally owned ships are distributed through Maritime Heritage grants to maritime museums in the United States. Transparency from the Maritime Administration is built into the legislation with mandated public release of key operational documentation and agreements involving MARAD. This is all discussed in an op-ed piece published yesterday in Maritime Executive, written by Denise Rucker Krepp, former chief counsel for MARAD - http://www.maritime-executive.com/article/Returning-Ship-Recycling-Funds-to-American-Museums-2014-09-24. We know laws already in place to prevent the scrapping of military ships outside the country were broken in allowing the destruction of STORIS and that will still require answers from key legislators and bureaucrats. While STORIS is discussed in the context of this op-ed as a vessel that should have been recycled in the U.S., that is the intent of the laws that were broken. It was our higher intention to see her PRESERVED as an active museum vessel, a whole other arena of ethics and responsibility shirked by the federal government. In her name, this legislation has the major potential to close the loophole that allows commercial ships to escape the regulations and practices that are meant to protect the environment and American workers. It will force a change of “business model” for shipping companies in making them more responsible in how their vessels are recycled. I also suspect that it will make it extremely difficult – hopefully impossible – for a situation like STORIS to happen again, with a U.S. vessel intentionally moved out of the country to skirt the costs of domestic scrapping by using cheaper foreign labor and ignoring environmental concerns. It will close the door to places like Alang, Gadani, and Chittagong. I believe this would effectively curtail the business model for certain so-called “metals recycling businesses” that have used that route to send ships to Ensenada. While the proposed legislation tackles a different set of issues, the introduction will – in a very important way – open a dialogue into STORIS herself and what happened to the ship in her own situation. There will have to be an explanation as to why the legislation is called what it is. This is an opportunity for those of us who care about STORIS to speak up and be heard. I encourage STORIS supporters to get behind this legislation and push for its adoption. It is one step toward some redemption. It is worthy that Duncan Hunter, the namesake of the National Defense Authorization Act language that should have made STORIS’ export illegal is on the House T&I Committee. I think everyone should reach out to his office on behalf of STORIS. A template for a letter to the legislators is located here: http://goo.gl/pq52dl. Feel free to personalize it to suit your own specific perspective, experience and feelings. 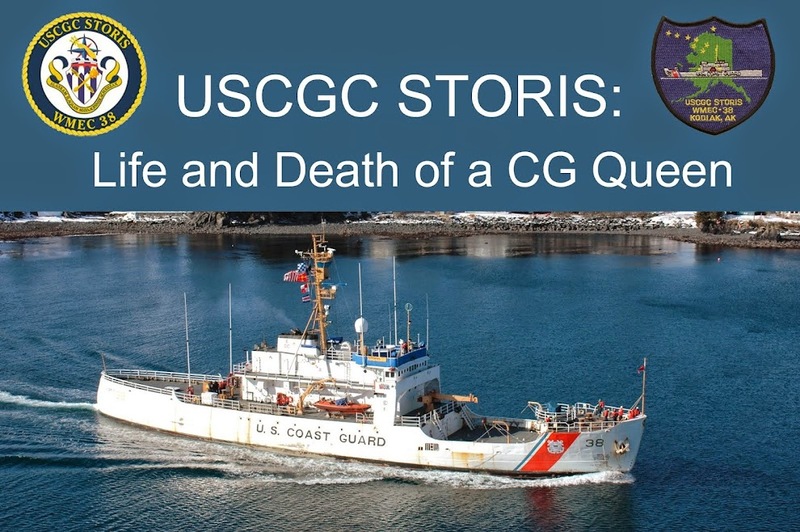 Again, this is a chance to speak up and be heard about our feelings and disgust in regard to the utterly contemptible treatment that STORIS and her crews received at the hands of our government, the very same government the ship and her Coast Guard heroes served for over 64 years. After reviewing the program, there were several topics that related to issues involving STORIS and ACUSHNET. Among the speakers were retired CG Commandant Robert Papp. The most relevant program was a presentation Saturday related to the benefits of listing on the National Register of Historic Places. Jim Loback and I nominated STORIS for listing in the summer of 2012 and she was listed officially as nationally significant on Dec. 31, 2012. A year later, she was being cut apart on the beach in Ensenada by Mexican yardbirds. I quickly wrote up an outline of the situation with a cover letter and sent the materials by email to Erika Seibert (erika_seibert@nps.gov), the representative from the National Park Service who was giving the presentation. I copied Paul Lusignan, the NPS official who had been involved with STORIS’ National Register nomination. I also sent the document to some other key people I knew were going to the event. After it was sent, it came to my attention that I had made a small error in the acronym for the National Environmental Policy Act (NEPA), for which I erroneously inserted “Protection” for “Policy.” That has been corrected in the document posted here. I have also updated my position as it related to Section 110 of the National Historic Preservation Act to further clarify the situation with the federal government’s responsibilities to preserve and protect STORIS and ACUSHNET. I have heard back that the document ended up in print form and was made available to several people, who picked up copies at the conference. I hope that it will do some good, as I was told that those people who picked up the document seemed to be thoughtfully reviewing it. STORIS should have been celebrated at this event, not mourned. September 15, 1948 - After a brief period decommissioned and in storage following World War II, the Coast Guard decides to transfer STORIS to Juneau, Alaska to take up the cargo carrying duties performed by the C1-M-AV1 class cargo ship USCGC UNALGA (WAK-185). 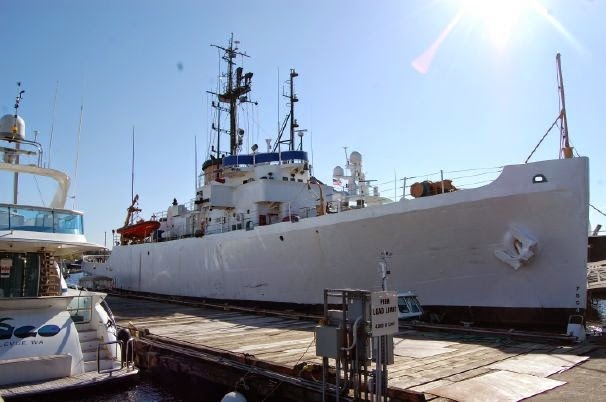 The UNALGA had been transferred to the Coast Guard from the Navy for use as a supply ship to help construct and supply LORAN stations in the Pacific Northwest and Alaska. STORIS quickly established herself as an extremely capable vessel for the LORAN duties. Her capabilities as a staunch, seaworthy SAR platform, Law Enforcement unit, and Bering Sea Patrol vessel in Alaskan waters would become legendary. 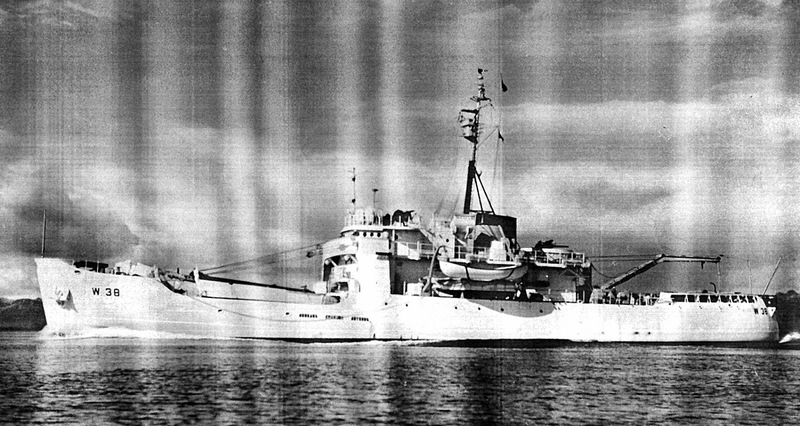 She would be based in Juneau until late 1957, when she transferred to Kodiak, her homeport for the remainder of her illustrious Coast Guard career. Meanwhile, in other news, ACUSHNET is still for sale. She is now listed through Yachtworld for $990,000. The price has dropped a bit from the earlier starting bid of $1.1 million on eBay and a lot from the $10 million "Buy-it-Now" price. She is currently listed on eBay Classifieds in the Seattle area and has also been on Craigslist a couple times this summer. Still waiting for information from GSA. I received a response to my request for an update and was told that the similar request from the New York Times takes precedence over my request. It is because of the media request that GSA supposedly waived the $10,266 in fees that they wanted to charge me. I was informed that it will be a "rolling release" and that the reporter at the NYT is dictating how the information will be coming out. As it is released to the paper, then the info will supposedly come to me. It has been over 10 months so far. 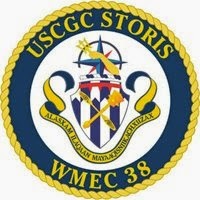 Help us share the STORIS story by sharing this Facebook page and the companion blog site at www.uscgcstoris.BlogSpot.com. It is my intention to create and publicize opportunities to be heard for all of us who are aggrieved and wholly disgusted with how this magnificent ship was allowed to be destroyed by the U.S. Government. We need everyone on board when the time comes. Thank you. For STORIS.